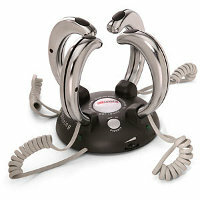 If you want to develop lightning quick reflexes, training with an enraged snake (the more poisonous the better, since it will up the ante) will definitely do that, but for a far less risky venture, you might want to check out the $29.99 Lightnight Reaction. This particular shocking party game will see the losers get a nice zap to their hands, definitely not a feeling that any of us would like. I guess it is also a deterrent for those who have hatched plans to perform some nefarious deeds down the road which might result in the electric chair, no? Parties need to be fun, and when you couple a free flow of booze with the chances of getting shocked, you know you’re in for a smashing time. After all, drinking alcohol will slow down your reflexes and perhaps dull your senses, increasing the chances of you “losing” at this game. Basically, four players will participate in this game, where each of them will grab a controller from the base unit. When the light in the middle of the base illuminates, make sure you are the first person to press the button on your controller – and get this, only the FASTEST person will be safe from any shocks. The shock factor can also be adjusted, depending on how much of a hero(ine) or wuss you are.